These pan seared scallops are luxurious and exotic, yet easy and fast to make – which makes them perfect for a special occasion romantic meal for two. Made without any dairy and served over zucchini noodles, they are compliant with the Paleo autoimmune protocol (AIP) and the starch-free Specific Carbohydrate Diet (SCD). 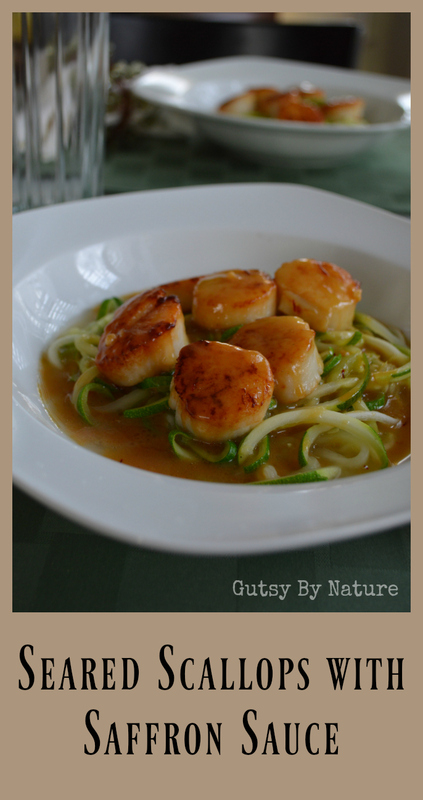 For this recipe you need the large sea scallops. I will never forget the sweet and delicate flavor of the fresh scallops I had one summer while visiting Massachusetts (where I learned that my ugly midwestern pronunciation of “SCALL-ops” was all wrong). So, if you happen to be making this dish in mid to late summer when these shellfish are at their peak and can get some scallops fresh from New England, go for it! Otherwise, frozen is fine as long as you allow time for them to defrost in the refrigerator prior to cooking. You may have heard before that saffron is the most expensive spice there is and this is true, but only by volume. A little bit of saffron goes a long way, so by the serving it really isn’t any more expensive than other flavorings. Make sure you get your saffron from a reputable source because “fake” saffron exists – it won’t hurt you, but you will have paid for nothing more than colored strands. I made this dish with some Iranian saffrom my husband brought back from a business trip abroad, but some of the highest quality saffron I have ever seen comes from the Rumi Spice company which was founded by American military veterans who wanted to help the people they had met in Afghanistan find a peaceful alternative business to poppy farming. What about my healing diet? This recipe is compliant with the AIP elimination phase. To make this recipe SCD legal, do not use the optional thickening arrowroot starch. To make this recipe low-FODMAP, omit the garlic. These pan seared scallops are luxurious and exotic, thanks to the alluring aroma and flavor of saffron, and are easy and fast to make. Perfect for a romantic dinner for two! Spiralize zucchini, then heat 1 tablespoon coconut oil in skillet over medium high heat. Add noodles with salt to taste, sauté, tossing gently as you cook, until just softened (3-5 minutes). Remove zucchini noodles from pan and set aside to keep warm. Rinse and dry pan. Melt remaining 2 tablespoons coconut oil over medium high heat. When oil is hot, add scallops, being careful to keep them from crowding each other. Let scallops cook without disturbing them for 3 minutes, then turn and sear on the other side for just 1-2 minutes. Remove scallops from pan and keep warm, do not rinse pan. Add garlic to pan and cook until fragrant (just a minute or so). Add broth to pan and use wooden spoon to scrape up any browned bits. Cook to reduce slightly (about 2 minutes). Stir in coconut milk and add arrowroot slurry if using. Stir well and then add saffron and salt to taste. 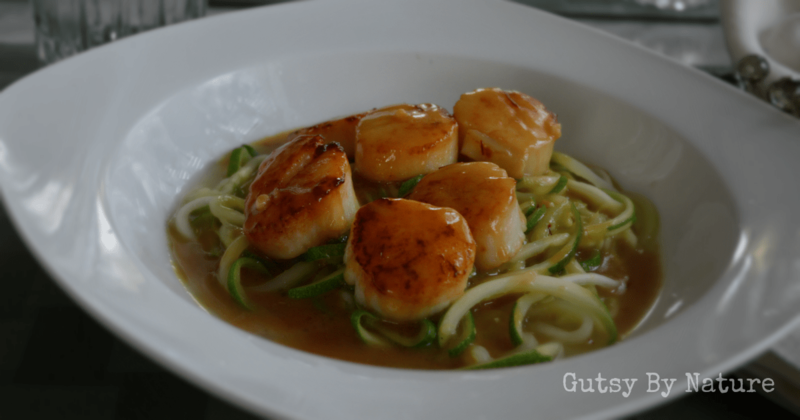 Divide zucchini noodles among two serving bowls or plates, place six scallops on top of each, and then pour sauce over each. Serve immediately.